A Stitch in Time Volume 1 is on its way! 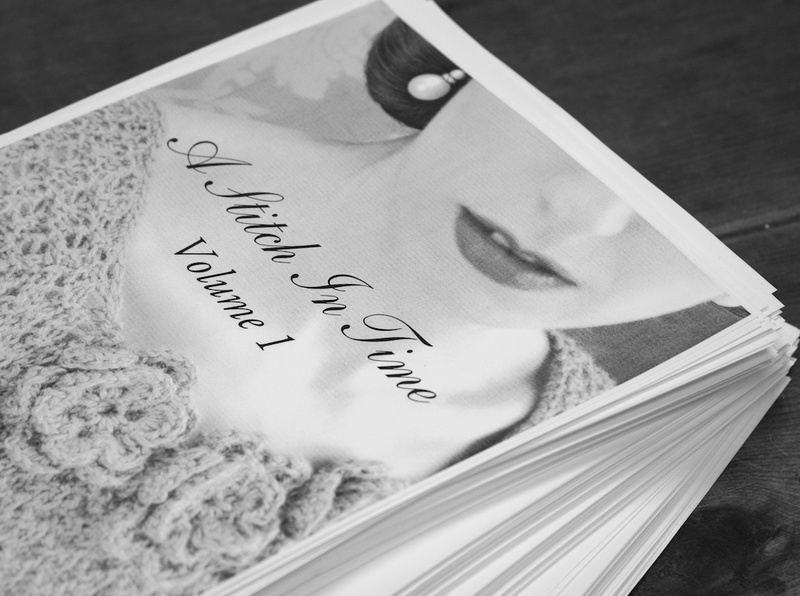 I am so excited to be able to announce that the re-publication of A Stitch in Time Volume 1 is ready to go ahead and will be available very soon. Thank you to everyone who has already pre-ordered their copy of the new hard back edition. I couldn’t have done it without you. 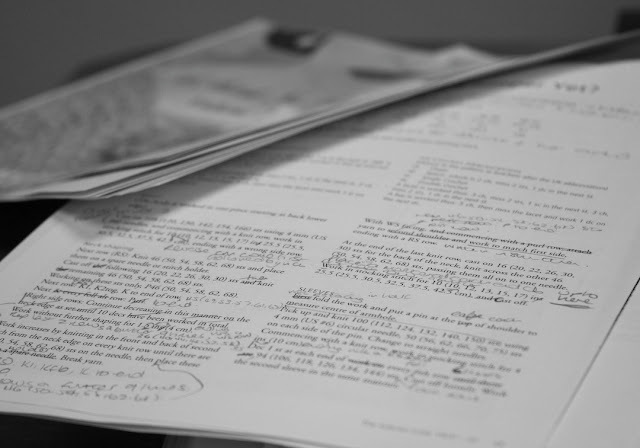 I am currently updating, editing, revising, improving and expanding many of the patterns in the book ready for the re-publication and am hopeful that this will be complete in the next few weeks. Our anticipated latest date for publication is end of July of this year. I’m hoping it will be sooner but I want to make sure every pattern gets a really thorough ‘going-over’ before the files head off to the printer. 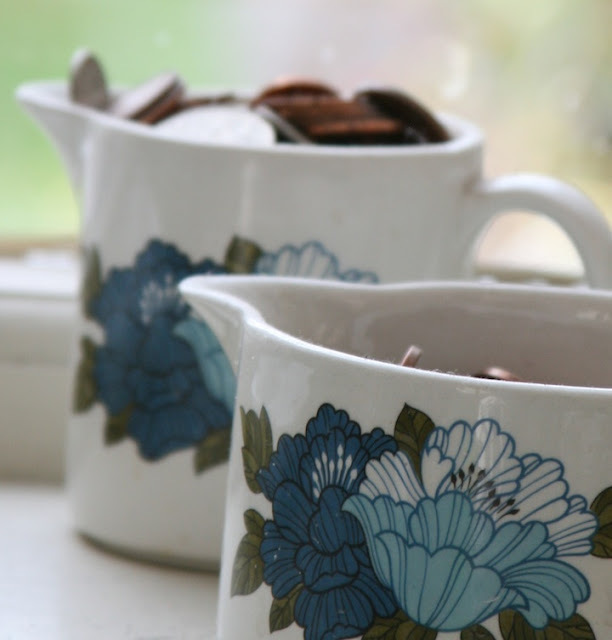 The amount of work involved in updating all the patterns is of course, substantial, so if the blog is a bit quiet over the next month please forgive me but there is a lot to do! Equally I will try and keep as up to date on the ravelry group and with email queries as possible but I will have to limit my on-line time quite severely if I’m going to be meet my deadlines. Those of you who have already read about the new version of the book will know that I’ve also decided to tackle the issue of the 59 patterns. It has always niggled away at me that there are 59 and not 60 patterns in the book. Its always struck me as a little untidy, and now I have the perfect opportunity to correct it. 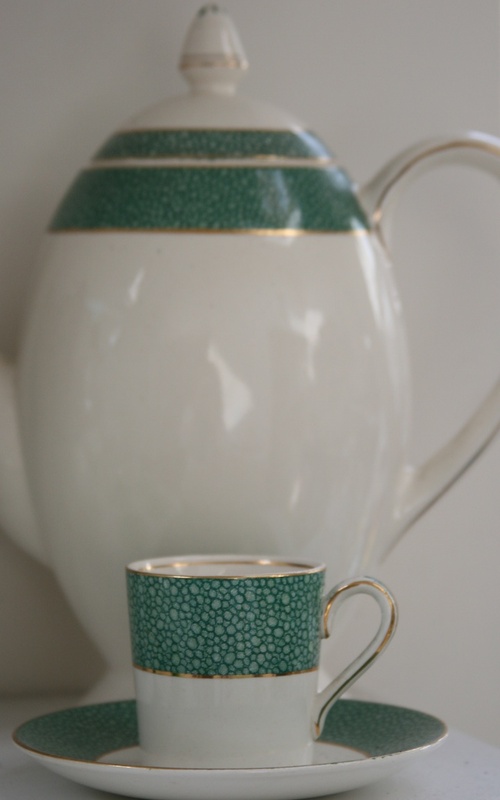 In addition to the existing 59 patterns in the book will be pattern 60. And what will pattern 60 be? All will be revealed very shortly! Volume 1 will remain available to pre-order for the time being, however, I will have to announce the cut-off date for names of pre-orderers being listed in the book very soon so that the final editing can take place. If you would still like the opportunity to be listed as a supporter of the re-publication do place your order very soon. 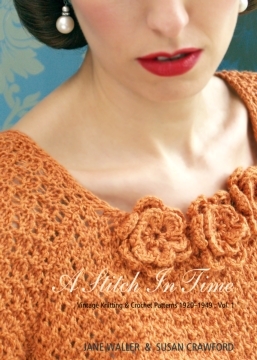 To pre-order your copy of A Stitch in Time volume 1, please click here. But in the meantime its back to editing for me! ... docksjo. Congratulations, you will now be able to knit the Icelandic shoes and Skautbuningur sweater as you wanted. I will message you on ravelry for your full name and address and then the book will be sent out by Helene. Today is a very important day. 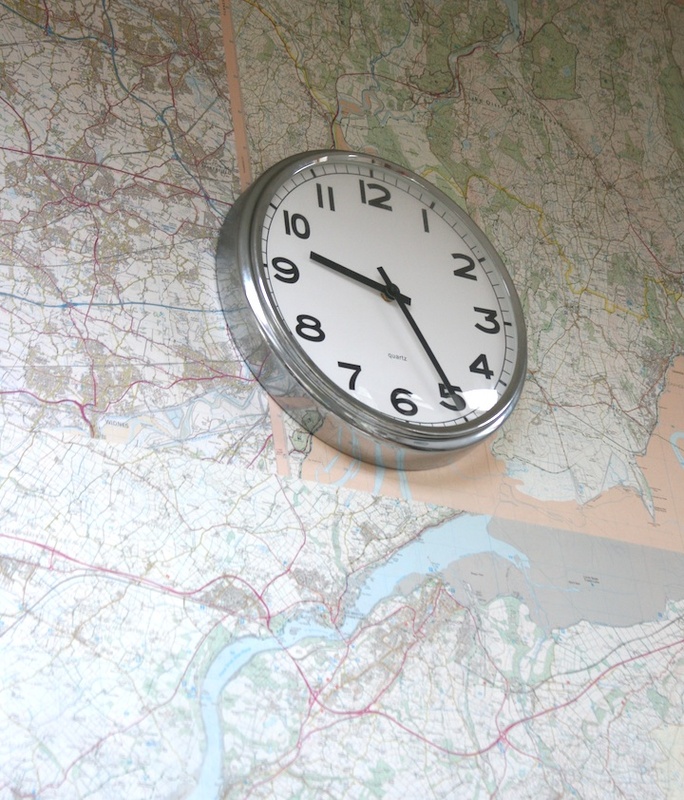 It is Mass Observation Day in the UK. at large to record everything they did from when they got up to when they went to bed - and today 76 years later, the archive is asking everyone to repeat the process. 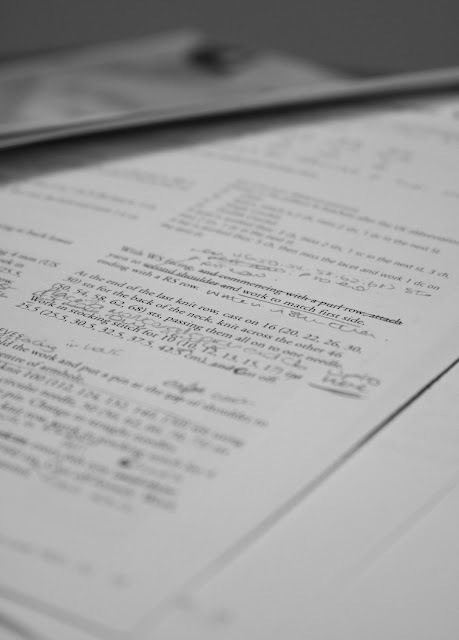 These diaries will then be kept alongside those from 76 years ago and will provide historians with a fascinating comparison and insight into how our world has changed or remained the same. I am somewhat obsessed with mass observation diaries and have learnt much from the often seemingly innocuous, almost throw-away mentions of what someone was wearing or what they were knitting, sewing or repairing. One of the most famous mass observation diarists is of course, Nella Last. Known as housewife 49 to the Mass Observation archive she wrote hundreds of thousands of words about her 'ordinary' life in Barrow in Furness. If you haven't read the three published books of Nella's diaries, I would highly recommend them. A fascinating anthology of observations can be found in "Speak for Yourself" first published in 1984. Many of the observations in this anthology are recorded by full time observers who travelled the country often anonymously recording life going on around them. In the early days much of this was done surreptitiously, with observers even sometimes 'infiltrating' organisations or groups to obtain a better picture of it. This covert-ness shocks me and yet I am well aware of how people change if they know they are being observed. It is now out of print but if you can get hold of a second hand copy it is a fascinating read. 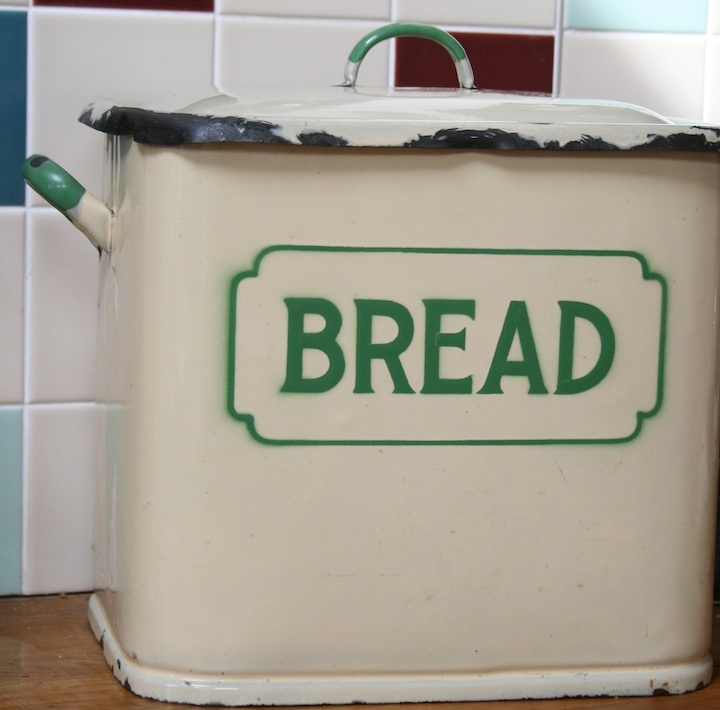 My enamel bread bin - battered but loved! 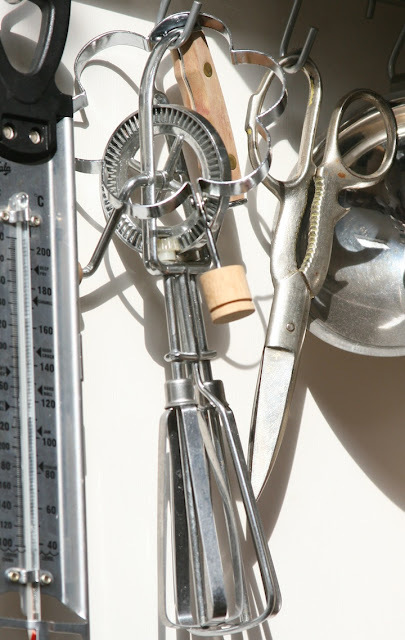 Hand whisk originally belonging to my Ruby nan, beautiful scissors found in the garden! 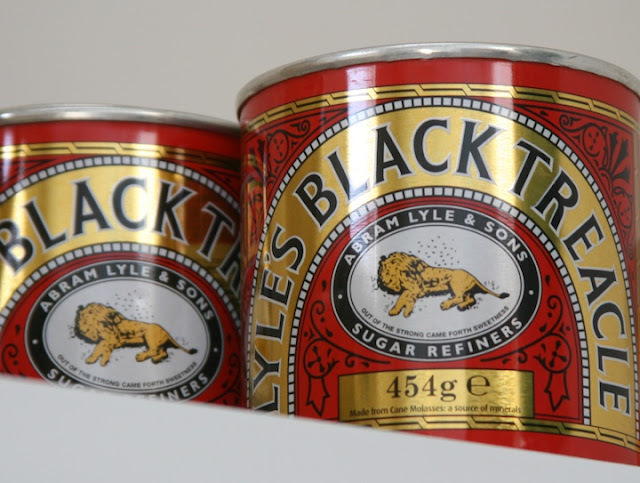 Empty black treacle tins - both the tins and the treacle are favourite things! ordnance survey maps of places we have been to. One of my most favourite of all my favourite things! I am delighted, proud and excited to take part in the blog tour for my lovely friend, Helene Magnusson’s new book, Icelandic Handknits. Helene has explored the knitted artifacts of Iceland’s textile museum in Blonduos and has created inspiring new designs from them. But if that wasn’t enough Helene also includes information on the textile history of Iceland and traditional Icelandic recipes. The recipe for ‘Salkjot og Baunir’ (split pea soup with salt lamb) has particularly caught my eye, as salt lamb is a delicacy also sold on Shetland and I have never been sure what to do with it before. Now I know thanks to Helene. The recipes, the beautiful colour photographs, the textile history and most of all, Helene’s designs, speak of Iceland and carry you off there. It is no surprise that Helene is also an award winning tour guide. She clearly loves the country and reveals this passion on every page of this book. 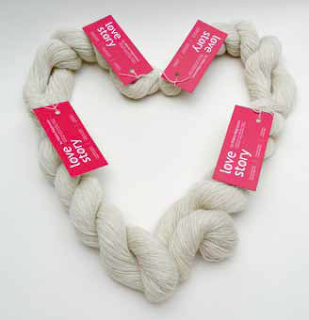 and in particular, Halldora, a rectangular shawl using Helene’s own ‘Love Story’ yarn. 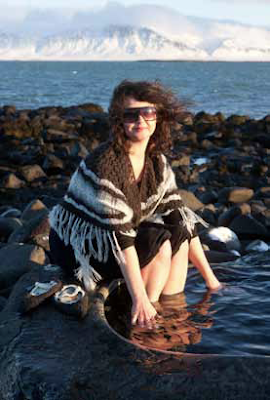 I am very lucky to own a skein of this fabulous 100% Icelandic wool created by Helene. Again Helene explains in the book all about Icelandic wool and what makes it so unique. S: You have been asked to exhibit at the Textile Museum in Iceland this summer. Can you tell me a little bit more about how this came about? 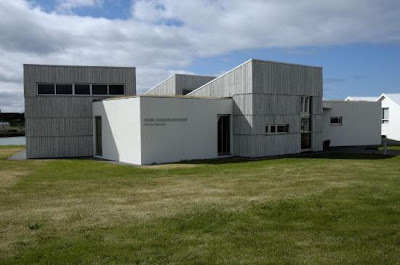 H: Every year, Icelandic textile artists and designers are invited to exhibit their work in the Textile Museum’s open area. 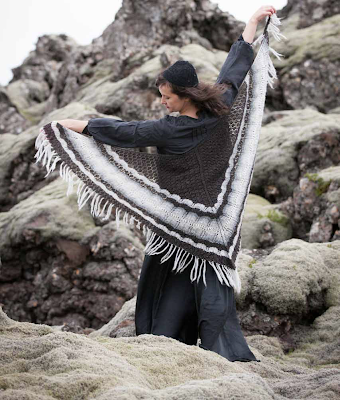 The exhibitions provide a sampling of the diversity in the Icelandic textile world. In the past, have been for example exhibiting internationally acclaimed fashion designer Steinunn or the brillant textile artist Hildur Bjarnadottir. So I was thrilled when I was chosen to exhibit this year. 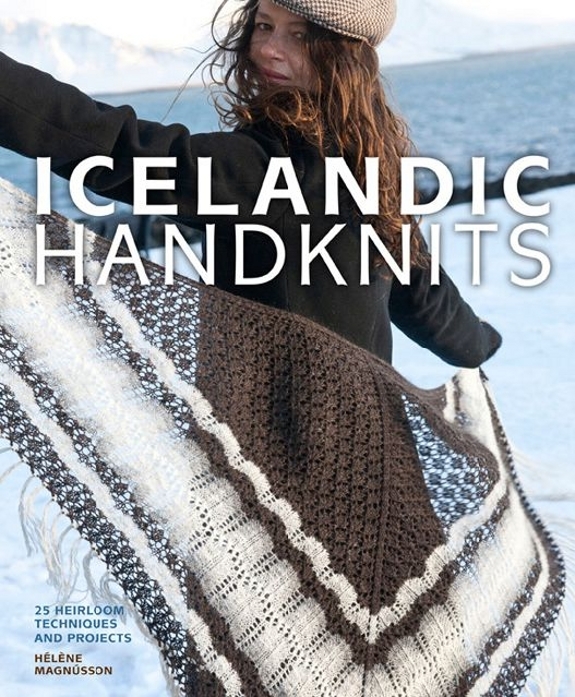 I will be showing knitting pieces, particularly the designs from the book Icelandic Handknits. They will be put in relation with the artifacts in the Museum that inspired them. The exhibition will be formally opened on May 26 and will continue during the opening of the Museum, from June 1 to August 31 from 10AM to 5PM each day, then the first months of winter on demand for groups. S: You, your life, your family and your work are intrinsically linked with Iceland. What is it about Iceland that is so special? 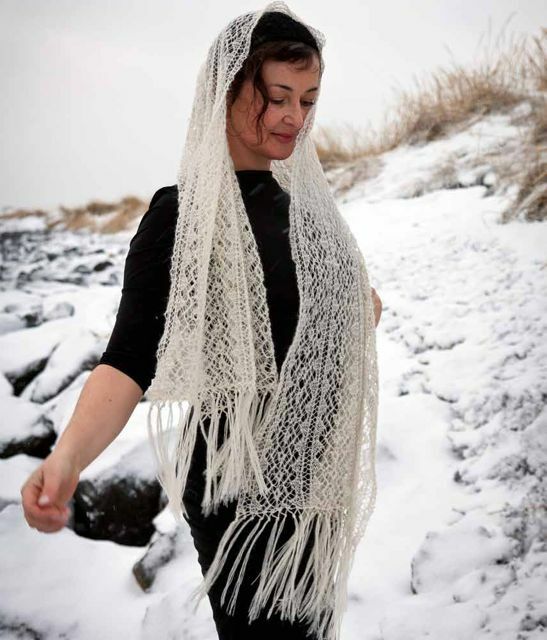 I’ve always felt home in Iceland and it seems natural to combine all of my interests, be it knitting, hiking or cooking under one umbrella: The Icelandic Knitter. I enjoy the harshness of nature and the freedom it gives. S: You also have your own very distinct contemporary style with an eye on fashion. How do you manage to so successfully merge traditional Icelandic folk costume with your own look time and time again? H: I have a training in fashion since I graduated from the Textile and Fashion section of Icelandic Academy of the Art and I’ve always liked to introduce into my wardrobe old pieces, from my great grandmothers or from thrift stores. 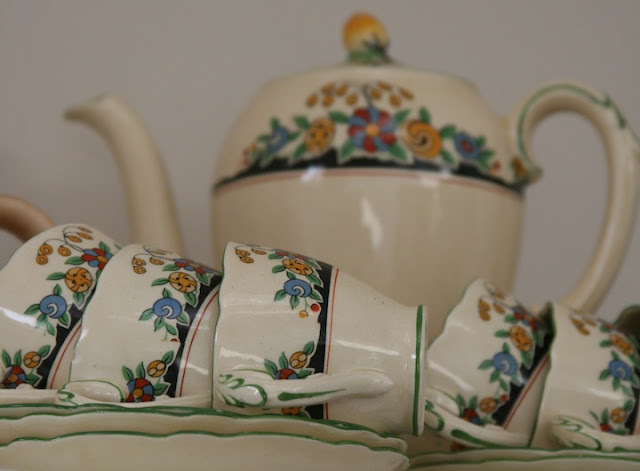 I like to mix old and new, in my home or cooking too! I think it’s mostly a question of balance between the two, so it doesn’t become a disguise, a costume or a uniform. S: I can see your ‘look’ in the photographs of the book. Is it important to you that the images selected for the book portrayed a theme? 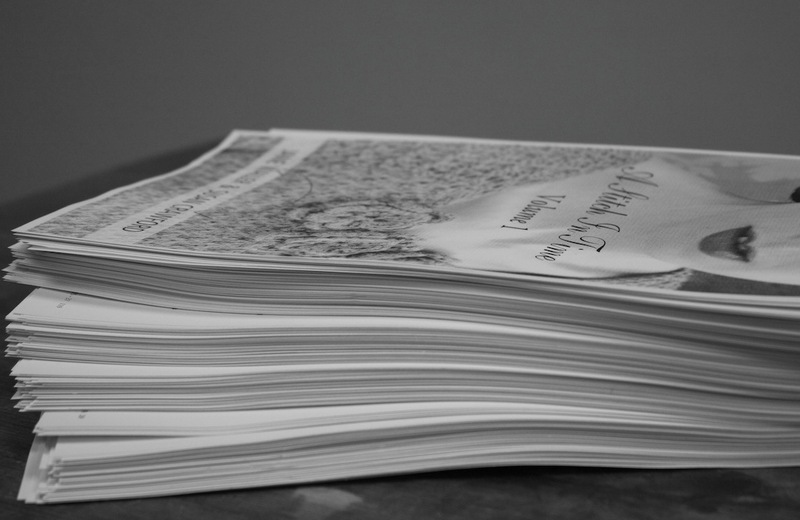 How much involvement did you get to have in the styling and photography for the book? H: I absolutely wanted the pictures to be taken in Iceland and I wanted those pictures to clearly show that they were taken in Iceland. When it came to work with a photographer, it was important to me that he would be able to convey my vision. Arnaldur who I have known for a while did a fantastic job in that respect. 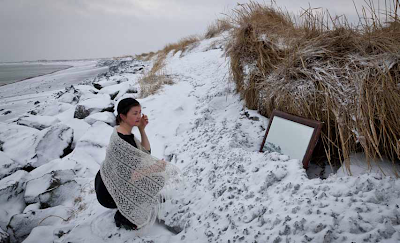 The look I wanted to achieve was of a strong Icelandic woman, braving the elements and standing for her convictions no matter what, at the image of the remarkable Halldora Bjarnadottir who did pioneering work in the education and culture of women in Iceland. Many artifacts in the Museum are from her collection and a special room is dedicated to her and her work. With the elements we definitively had to be brave! The photoshoot took place in January with only 3 hours light and a snow storm followed by a terrible wind and temperatures way below zero! S: I am very intrigued by the missing lopi jumper. 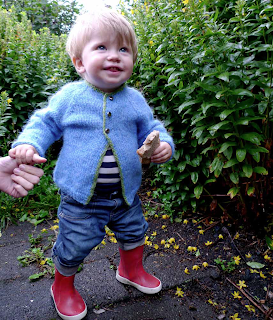 Often what we perceive as tradition is actually relatively recent - the yoked jumper of the Shetland Islands is another such example - could you tell us a little more about the lopi jumper and how this particular style came about. 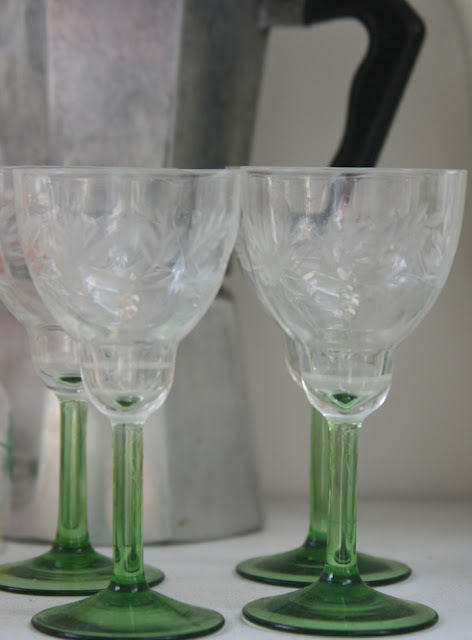 H: Nobody knows really when it came about, but probably in the 1950s or 60s. There are a few women I have interviewed who claim to have been the first. What is for sure is that it had become immensely popular in the 70’s, it was the “hippie jumper” then it has had its ups and downs. Sometimes it’s out, sometimes it’s in. At the moment it’s in! S: You put great thought into the fit and shaping of your garments, with clever touches such as short rows in the elbows. 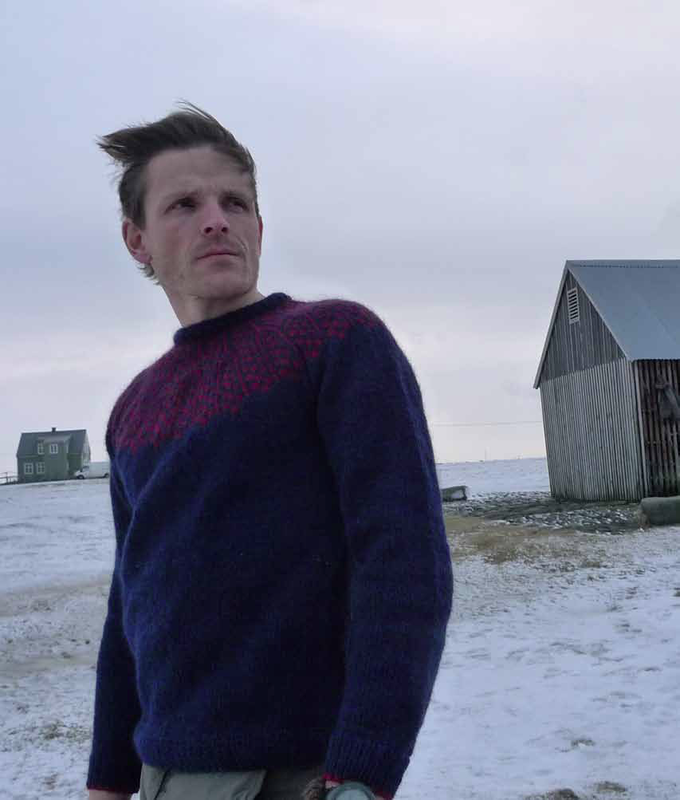 Can you tell us a little bit about the traditional construction of an Icelandic garment and the little extras that you have introduced to them to make them fit even better. Which patterns in the book demonstrate this best? H: Little is known about the construction of women jackets but they were knitted on very small needles in a very intricate manner, with a very close fit, knitted slightly bigger then felted, but still perfectly shaped to the body of its wearer. This was a common feature in the old days, adding fabric, reducing friction and thus preventing the formation of holes. 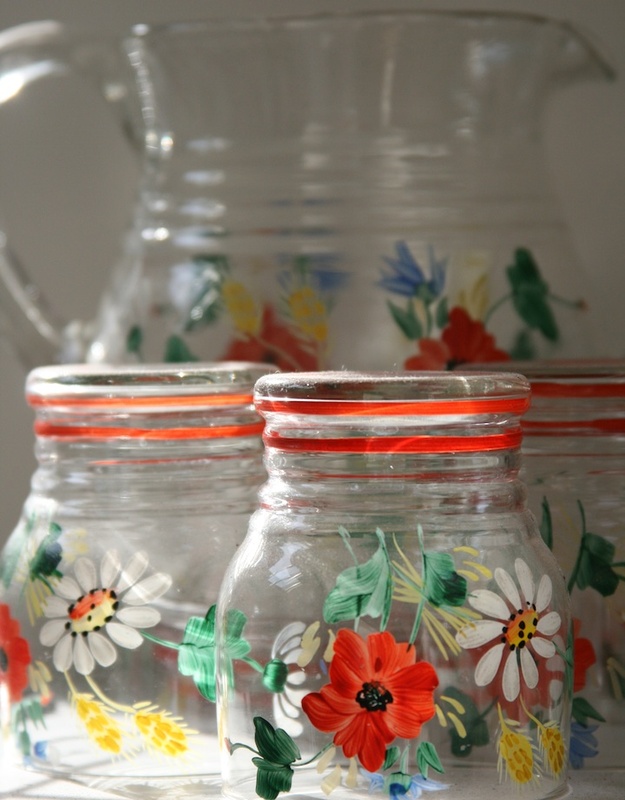 As a matter of fact, many garments are mended in many places but the elbows are just like new! More is known on the other hand about the construction of men’s jacket. Skúli Magnússon, first bailif of Iceland, even gave a recipe for a “perfect man’s sweater”, some time between 1760 and 1770. The Perfect Little Icelandic Sweater in Icelandic Handknits is the occasion to try this unusual construction where the body is knitter upward in the round with side and back shaping, the back knitted higher up, with raglan decreases in the yoke but the arms knitted from the top down, again with the elbow shaping. S: Finally, if I get the chance to visit Iceland one day, could you suggest in your role as Iceland’s premier tour guide, where would be the best place to start! H: Well, I’d suggest of course that you come and visit me at my design studio to begin with – the view above the Reykjavik habour alone is worth the visit! There is a rich knitting tradition in Iceland and so many places worth visiting combined with amazing nature. Each season has something different to offer and winter time is no less breathtaking and interesting for a knitter. I try to reflect this diversity in my knitting tours, all year long: each has its own theme based on particular knitting traditions and techniques - and explore a different area in Iceland. You can also purchase copies of Icelandic Handknits and her Love Story yarn from the website too but Voyager Press has also very kindly offered a copy of Helene’s book as a prize on the blog, so if you would like the chance to win a copy of this fabulous book, simply leave a comment below by Thursday 16th May and I’ll pick a winner at random shortly after the deadline. Please include an email address so that I can get in touch if you win! So thank you Helene for visiting the blog and taking the time to answer my questions and for creating such a fabulous book for us to enjoy. Today finally sees the culmination of over two years of enthused discussions between myself and my good friend Julieta of knitshop.co.uk. Julieta and I have known each other for around six years now and as the creator of her own brand of yarns she has always been really supportive of my book and pattern projects providing yarns when ever approached. 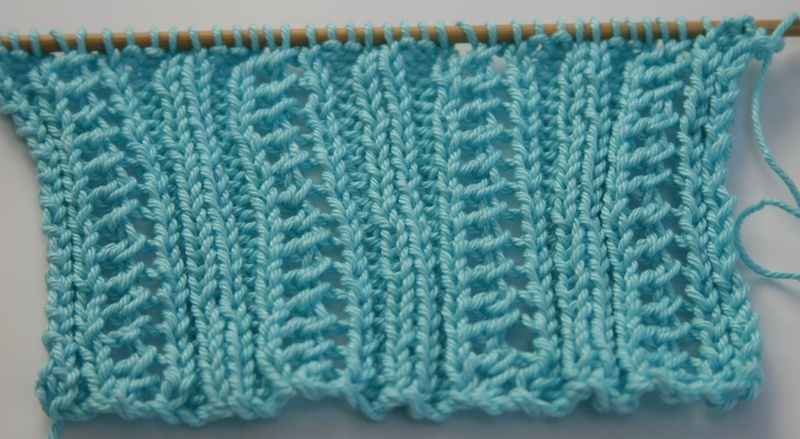 I have used knitshop Mulberry Silk for example in both volumes 1 and 2 of A Stitch in Time. What I really wanted to do though was work on a cotton range together that would work perfectly for the vintage projects that needed it and also offer a lower price option for the Mulberry Silk projects in the books. Since Rowan discontinued their 4 ply cotton this has become more and more of an obsession with me. Several designs in volume 1 including the iconic Light and Lovely used this yarn and in light of volume 1 being re-published I wanted to be able to provide an alternative that would be in the appropriate colours and that wouldn’t be discontinued for the forseeable future. Light and Lovely from A Stitch in Time Volume 1. 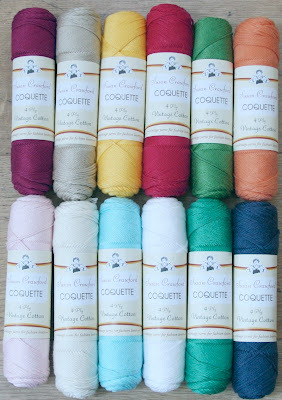 And so Coquette was born. It is a very high quality mercerised cotton grown in Turkey on small family-run farms and then spun in Bulgaria on equipment still in use since the 1930s. Julieta will be reporting from the mill this summer when she makes her annual trip there. The cotton is spun into beautiful old fashioned balls which got me very excited. I have initially chosen 12 colours that include most of the colours of 4 ply cotton that I have previously used in the Stitch in Time books and will be working on additional colours for next year and beyond. Wine; Oyster; Canary; Flame; Highland; Pumpkin; Carnation; Old Lace; Aquamarine; Snow; Spearmint and Sapphire. 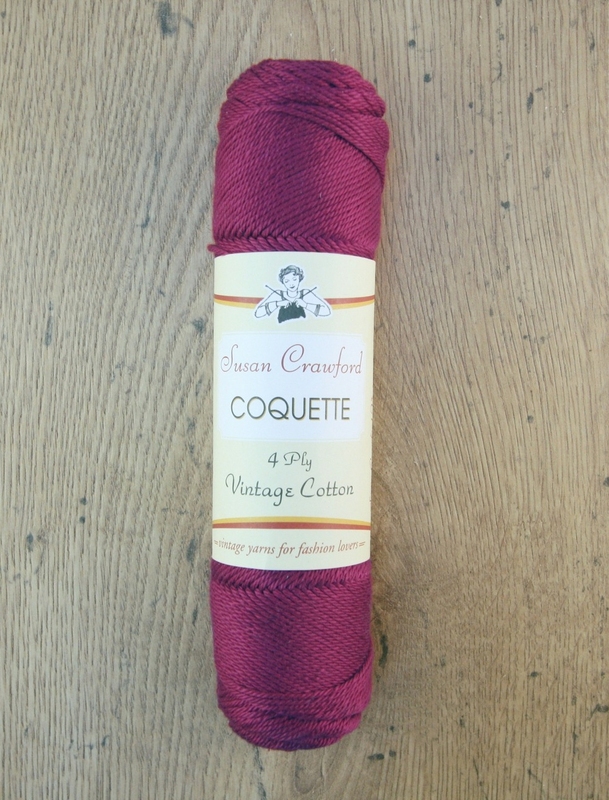 The cotton creates an exquisitely even fabric with a slight sheen and depending on the tension and stitch pattern used can appear either firm or drapey. 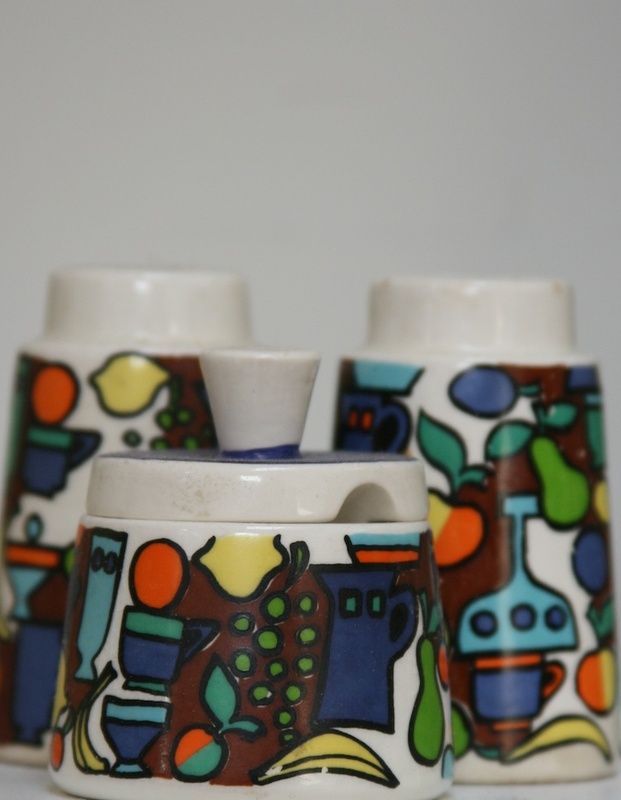 It can even be pressed to obtain that vintage woven fabric appearance of so many of the designs of the 30s through to the 50s. I think its shown to its best advantage here in This Attractive Affair from A Stitch in Time, Volume 2. Knitted using Wine and Oyster, this design requires the yarn to behave almost like a woven fabric. It needs to be pressed, eased and sewn together and then finishing touches such as button loops added. The collar knitted in four separate pieces needs to lie flat but have enough body not to blow around. 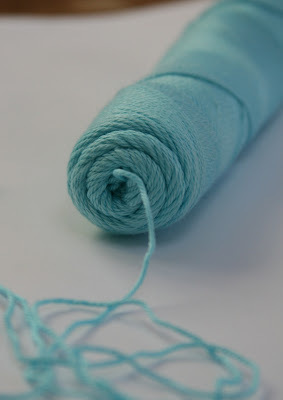 When I was deciding which yarns to use for this project there was only ever one choice. I knew instantly that Coquette would work perfectly. 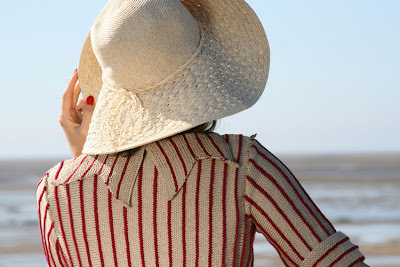 Maintaining the summer mood Coquette can also be used to knit your very own swim suit. 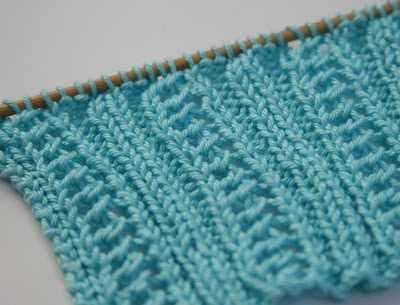 The Call of the Sea from A Stitch in Time Volume 1 can be knitted using Sapphire and Snow. The firmness of the cotton as previously discussed here creates a really supportive fabric for bathing or simply lounging! Coquette also looks fabulous used for textured stitch patterns. This is my sample piece for the revised pattern for Knitter's Delight from A Stitch in Time, Volume 1. The stitches are nicely formed and the very subtle sheen on the yarn helps light bounce off the sample giving further definition. 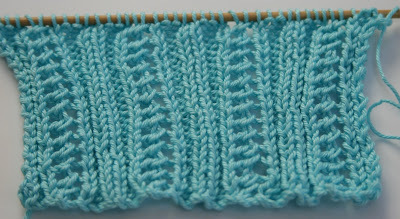 Its also really easy to knit a lace pattern with this yarn. I'm using a 3.25mm needle here and the stitches move easily on the needle and work together as needed without any difficulty. And in case you've forgotten what Knitter's Delight looks like. 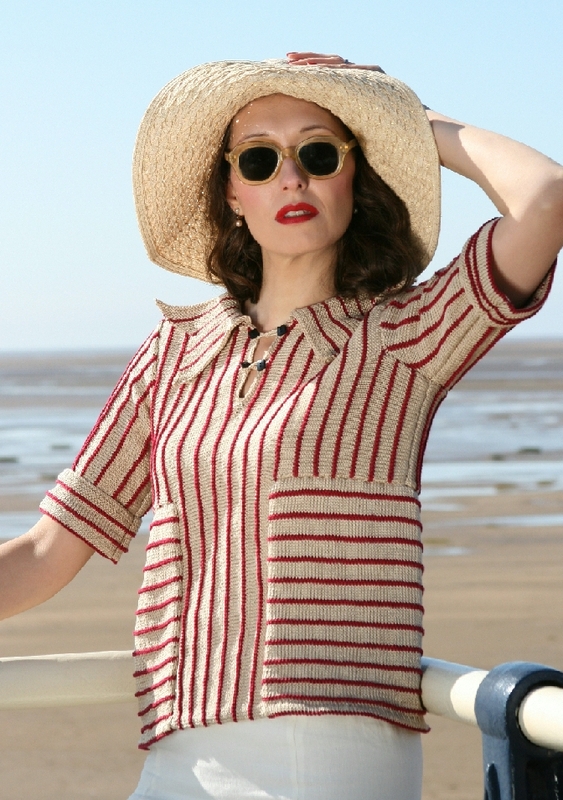 Here she is as shown in Volume 1, using the discontinued cotton. 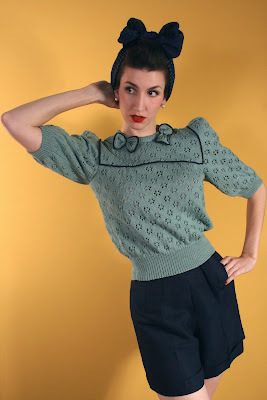 Coquette is also used in Volume 2 in the fabulous 1950s Jumper with Collar and Flowers. Again the strength of the fabric created with the cotton allows for pressing and ensuring a perfectly flat collar. 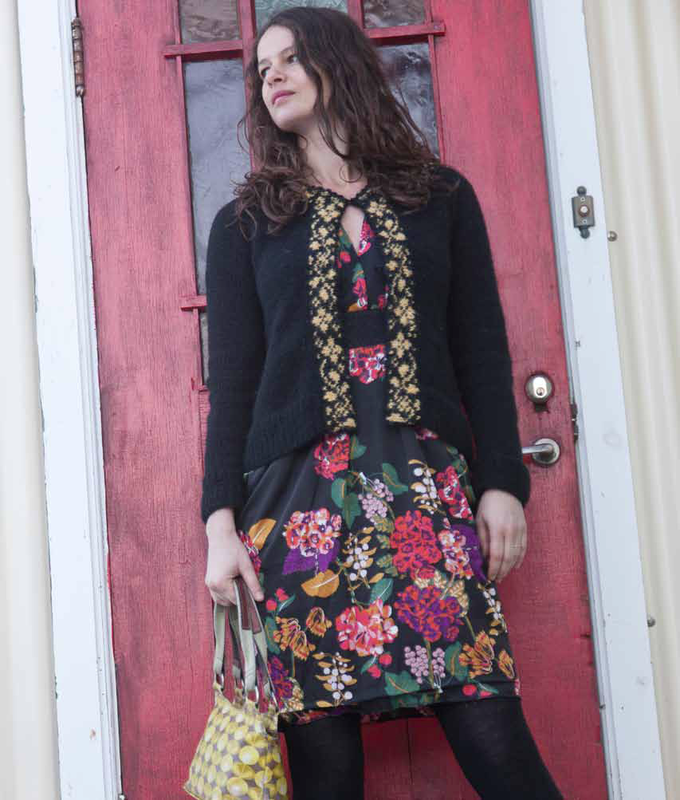 It is also perfect for the crochet details and flowers on the jumper and there will be more crochet patterns to come! Coquette will normally retail at £4.95 per 50gm ball and it has a meterage of 125m per ball. 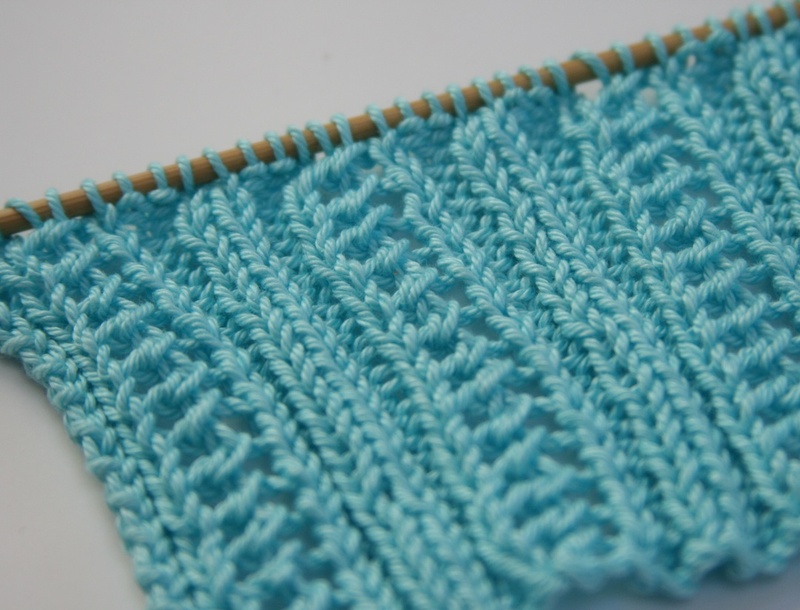 The recommended tension when using a 3.25mm set of needles (or 3mm) is 28 sts and 36 rows, although it is very flexible and knits well to other tensions too. 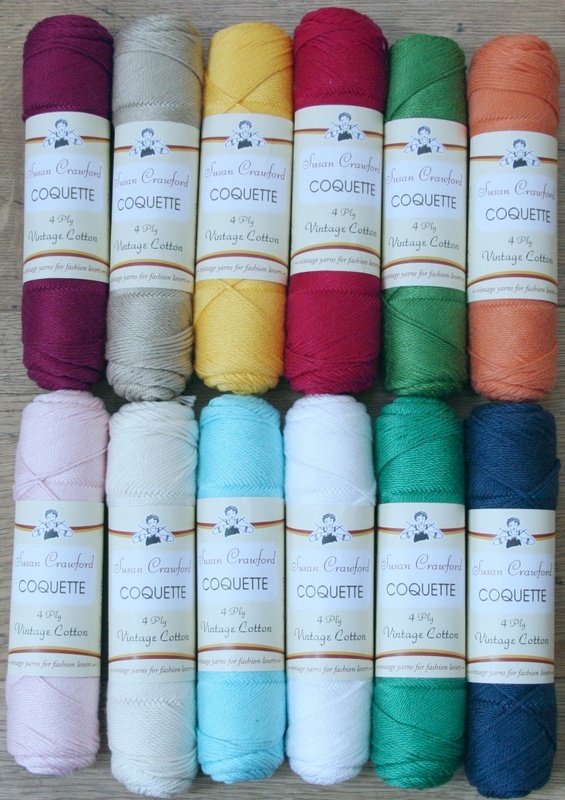 For a limited period however I'm delighted to announce that Coquette is available from my website for only £4.45 per ball. Finally for today, one of the things I particularly love about these wonderful vintage balls of yarn is the perfect centre pull.